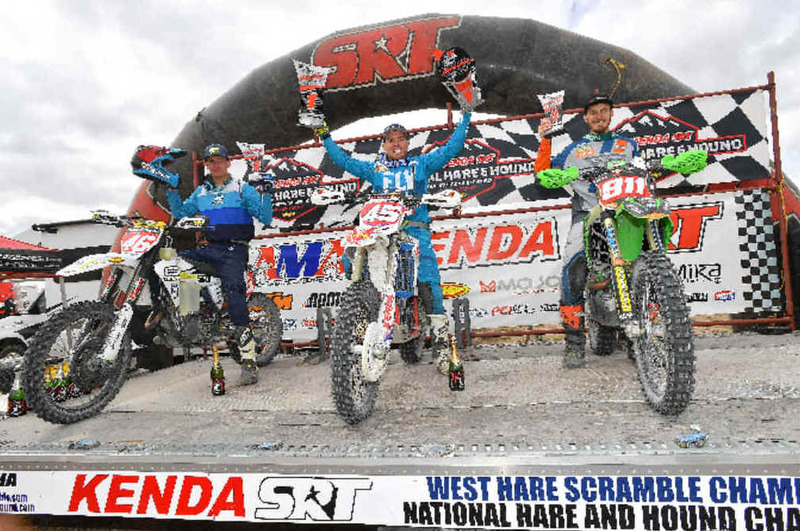 The KENDA SRT AMA National Hare and Hound Championship Series journeyed to the first of two Utah rounds, for the 59th Annual Cherry Creek National hosted by the Sugarloafers MC. The one-day event was jam packed with awesome weather and racing for riders of all ages and skill levels. The banner dropped early Saturday morning for the Pee Wee class; the first race of the day. Following the start, it was not long before Maddix Park moved into the lead, and remained there for the entirety of the 30 minute long race. Not far behind Park was Taeson Smith, racing in 2nd OA, and a battle only a little ways behind him for 3rd OA between Amre Jenkins and Jaxson Sippel. The checkered flag waved as 1st place, Maddix Park, came through the scoring chute. Taeson Smith finished in 2nd OA and Amre Jenkins finished 3rd OA to round out the Pee Wee podium. The second youth race of the day saw the Big Wheel class as well as Mini, Jr. Mini, Micro Mini, Girls, Junior Girls, and the Trail Rider class. Coming through the scoring chute off of the first lap in the lead was Davin Rhodes. Roughly 30 seconds behind him racing in a 2nd place position was Otto Pearson. Lane Forbes raced in 3rd OA behind Otto Pearson for the entire race, landing himself a spot on the Youth Overall Podium. The Big Wheel podium was topped with Davin Rhodes next to Otto Pearson in 2nd and Lane Forbes in 3rd. In the same race, Jett Lessing was racing in the lead for the Mini class to take home the win as Stren Broadhead finished 2nd in class and Zachary Francies finished 3rd in class after battling for a top 3 spot with each other. 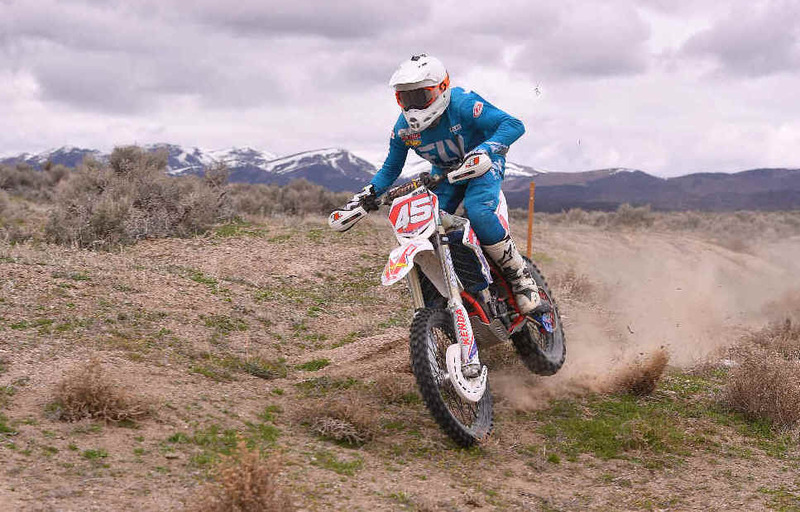 For the Micro Mini class, Brennen Watson raced in the lead for the entire race, making for his third consecutive AMA National Hare Hound win of the 2019 season. Close behind Brennen in 2nd was Caleb Tate, with Ryker Sperry in 3rd to round out the 65cc podium. For the Girls classes in the last Youth race of the day, Alijah Delatore raced in the lead to top the Girls podium. Delatore remained in the lead for the entire race with Allie Stambaugh, Cately Jenson, and Kortney Kearsley battling for a podium spot. Stambaugh finished the race in 2nd next to Jenson in 3rd to round out the Girls podium. As for the Junior Girls class, Kyra Lundgreen took home the win next to Zina Price in 2nd and Maliza Griffiths in 3rd. As the adults lined up for the final race of the day, the banner dropped, and it would be Factory Beta's Joe Wasson who would steal the lead with the hole shot , but would soon start his battle with 3Bros/SRT/Husqvarna backed Dalton Shirey just after the first turn. Shirey would be the first one through the scoring chute off of Loop 1 with Wasson in a close 2nd and Jacob Argubright in 3rd. Kolton Lynn would come in 4th, with Tuffy Pearson close by in 5th to round out the top 5 racers in off of the first loop. For the Pro 250 class, Daemon Woolslayer would come in the lead off of Loop 1 with Factory Beta's Zane Roberts 11 seconds behind him in 2nd, and JCR Factory Honda backed Preston Campbell in 3rd. Coming into the scoring chute for the Pro Women's class, it was no surprise that Brandy Richards was in the lead. Although Richards lead on the class was untouchable, Britney Gallegos and Rachel Stout were keeping up the pace to land themselves a spot on the podium. The 25-mile long second loop was coming to a close and pit row was anxiously awaiting for their racers to make their pit stops and prepare for the last 45-mile loop. To the spectators surprise, after seeing the lead Shirey had on the first loop, Wasson was now in the lead with Argubright putting the pressure on in a 2nd OA position with Shirey now in 3rd. Tuffy Pearson came through the pits in 4th OA, with Purvines Racing-backed Axel Pearson only seconds behind in 5th. Roberts had now taken over the lead for the Pro 250 class with Woolslayer now in 2nd in class. For the Pro Women class, Richards was still in the lead, but now with Stout behind her in 2nd after gaining a lead on 3rd place Britney Gallegos. The checkered flag was quickly flown out for Factory Beta's Joe Wasson at the end of the third loop; marking him the winner after 95-miles. 3Bros/SRT/Husqvarna backed Dalton Shirey would finish 2nd and Jacob Argubright would finish the race in 3rd to round out the Pro podium. Argubright and Wasson would now be tied in points for the 2019 Championship title with one race to go before the summer break. The Pro 250 podium would be topped by Factory Beta's Zane Roberts in 1st, Daemon Woolslayer in 2nd and JCR Factory Honda backed Preston Campbell in 3rd. For the Pro Women's class, Brandy Richards would top the podium next to Rachel Stout in 2nd and Britney Gallegos in 3rd. Loop 2 finishers would see a win from Women C rider Ty Woolslayer, and in the Master's 60+ class, Steve Pitts would take home the win next to James Miller in 2nd and Larry Engwall in 3rd. The Pioneer 70+ class would see another win from Larry Barlage. The Women A podium was topped by Ashlee Gage in 1st, Allie Dorsey in 2nd, and Kari Erickson in 3rd. The NHHA would like to thank our racers, families, staff members, and most of all, Sugarloafers MC for helping us with such an awesome race weekend. We hope to see all of our racers out at Round 5 in Little Sahara OHV, Utah.